A fascinating journey into the bioeconomy’s world through a series of interviews with its main protagonists: big companies such as Clariant, Novamont, UPM, Braskem and Novozymes, clusters, universities and research centers, political and economic institutions. 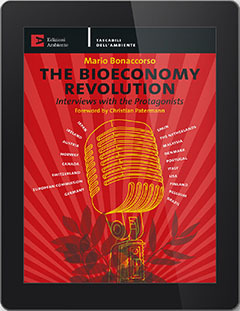 This is The Bioeconomy Revolution, the first book telling from inside the bioeconomy, which can be defined as an economy where the basic building blocks for materials, chemicals and energy are derived from renewable biological resources. The bioeconomy involves a paradigm shift across the whole economy. It is the revolution of the third millennium. After that driven by steam in the 18th century, that driven by oil in the 19th and the technological one in the 20th century, in the 21st century the industrial revolution is driven by biological resources, in the name of a sustainable development of world economies, for which somehow we will go back to where we started, to a civilization more careful to the equilibrium with the nature. Without sacrificing the progress.